Why would anyone want to pour their heart and their money into a precious puppy, do the hard work of housebreaking, obedience training and socializing them, only to have to give them up in about a year? That’s the first question I asked Alice Boose, a long-time puppy raiser for Southeastern Guide Dogs. I first met Alice at a writers group meeting last spring. A gentle, soft-spoken woman, she had wonderful things to say about Southeastern, and she was thrilled to see me out and about with my guide dog Cleo, a real-life example of what the program is all about. 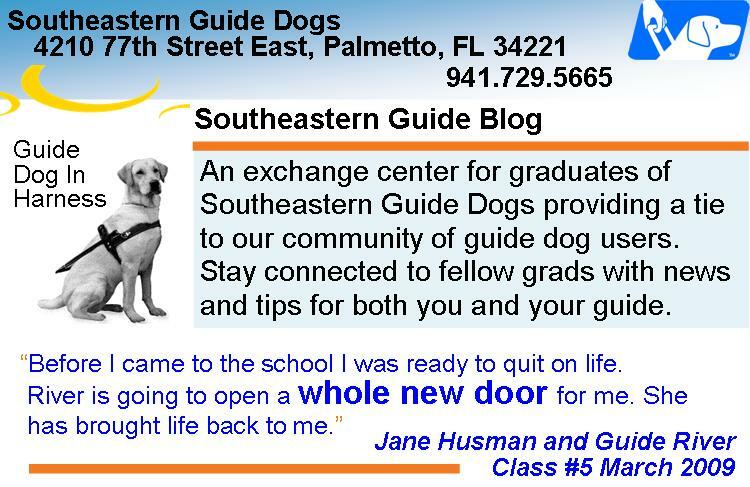 The woman told her, “Southeastern Guide Dogs,” and explained where it was located. Alice says she also recognized that this was a made-to-order community service for her, because her mother was blind, as well as two of her mother’s sisters, and Alice could appreciate the work and mission of the program. Puppy hugging was only the beginning. Alice soon began walking dogs, participating in walkathons, and performing other volunteer work for the school. On her first walkathon Alice raised enough money to name a dog. She decided if she could name a dog, she ought to raise it. So twelve years ago, she and Bob began raising puppies. Their first dog was a goldador named Grace. Their most recent dogs have been collies. Presently, Alice says they are without a puppy but might like another.